crashed at Buckeye, AZ: during a hover in a confined area the pilot misinterpreted his passenger signal to move to a different location as a signal that the tail rotor was in danger. The pilot used abrupt control movements that resulted in the toe of a skid hooking into a wire fence. The helicopter rolled over after the pilot attempted to abort the landing according to the pilot report. Two on board escaped uninjured. 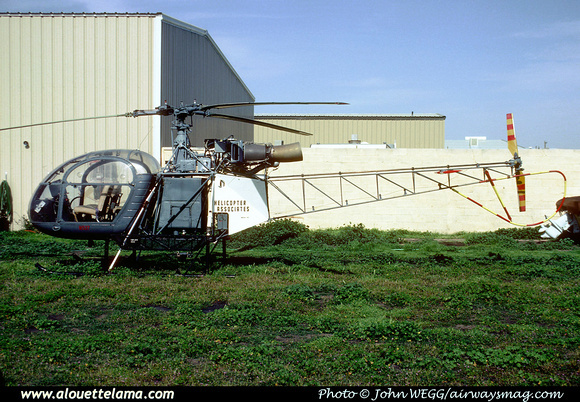 N537 Eurocopter (Aérospatiale) SE3130 Alouette II MSN 1150, Helicopter Associates - United States of America - 03-1983 - Photo John Wegg, Pierre Gillard collection.